Enjoy Broadway Rose productions with a group of 10 or more and receive a discount on each ticket! 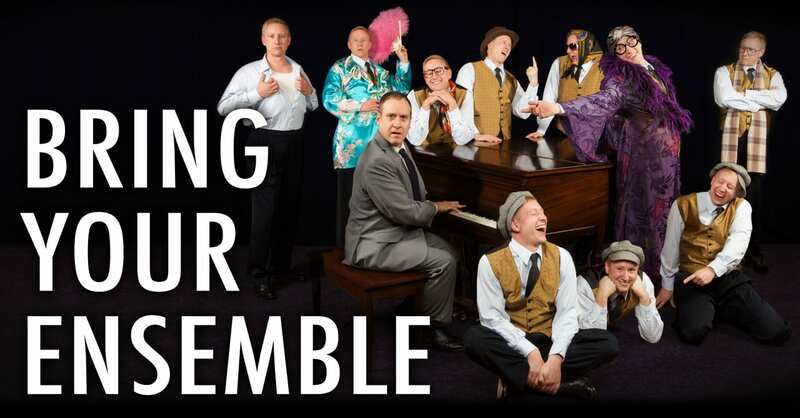 Bring your friends, family, or co-workers together to enjoy fantastic musical theatre. We will happily accommodate your group, large or small, and work with you to ensure a fun and memorable experience. Broadway Rose offers exceptional musicals at affordable prices, convenient locations with free parking, accessible seating, and food and beverage concessions. For show dates, seating information, and group ticket prices, please click here. Select a performance and estimate how many people will be attending with you. Call Group Sales Manager Katrina Christiansen at 503.906.2378 to reserve your seats with a $100 deposit. 30 days prior to the performance confirm total attendees and pay the balance. Need more information? Read on! A minimum of 10 people are required to receive a group discount. Reducing your order to fewer than 10 tickets per performance disqualifies you from group prices and regular ticket rates apply. Groups of 30 or more may qualify for up to two complimentary tickets for group leaders. Group discounts are not offered for mainstage preview night performances, back section of the Deb Fennell Auditorium, or Friday evening performances in the upper section of the New Stage Theatre. When making your reservation, please estimate numbers carefully. Contact the Group Sales Manager immediately if you have a change in the number of tickets you require. All group sales require a signed agreement. Performance times and casting are subject to change without advance notification. Our Sunday matinees regularly sell out quickly; consider a Saturday or Thursday matinee (when offered) for the best tickets for your group. Behind-the-Scenes tours and artist talk-backs and other offerings may be available—ask about them when making your reservations for more information. Our theaters require the use of stairs to access most seating. Accessible seating for patrons with impaired mobility, including patrons using wheelchairs, scooters, walkers, canes, and crutches, is limited at both our venues and tickets are sold on a first-come, first-served basis. Please alert the Group Sales Manager of your guests’ needs at the time of booking. For safety reasons, we require groups to provide one attendant for every five guests who require assistance navigating ramps, stairs, and/or restrooms, and must accompany guests as needed. Attendants are responsible for assisting the individual group members to their seats, storing and accessing walkers, wheelchairs, scooters, etc., and (if necessary) physically assist individual group members transfer from a wheelchair to a seat. Our theater offers a limited number of assistive listening devices that may be checked out for free and picked-up at will call. Complimentary large print programs are available upon request. Please inquire at the box office. One performance per show is audio-transcribed and must be reserved in advance. Please contact the box office for dates. Price quotes and a hold on seats are good for two weeks from the date of booking. The group sales agreement must be signed and returned within two weeks of booking with a $100 deposit per show. Multiple dates require separate agreements and deposits for each show. If the signed agreement and deposit are not received within two weeks of booking, tickets will be released. Full payment and final count are due 30 days prior to the performance date. Should the total number of tickets drop below 10, all tickets will revert to the single ticket price. If full payment is not received 30 days prior to the performance, tickets will be released and the deposit minus a $20 cancellation fee will be returned. Group reservations made less than 30 days prior to the performance must be paid in full upon ordering. Tickets can be picked up at will call one hour prior to curtain or can be mailed, time permitting. CANCELLATIONS: Orders canceled prior to 30 days from the performance will receive a full refund minus a $20 cancellation fee. If canceling multiple shows, a cancellation fee is applied to each show. Orders canceled within 30 days of the event will not be refunded. REFUNDS: All ticket sales are final and non-refundable for individual, group, and season tickets. Broadway Rose Theatre Company is committed to not canceling a performance due to weather. EXCHANGES: We require that tickets are exchanged with a minimum 48-hour advance from your scheduled performance date. Tickets are subject to availability and a $5.00 per ticket exchange fee applies. The lobby opens 90 minutes and seating begins 30 minutes before the performance. We suggest groups arrive 30-45 minutes prior to the performance to allow time to be seated comfortably. Group leaders are responsible for the tracking and distribution of tickets prior to entering the theater lobby. Performances begin promptly. Late arrival seating and re-entry into the theater at any point during the performance is at the discretion of the house manager. Cell phone use (including text messaging) is not permitted in the theater. Outside food and beverages are not permitted in the theater. Children under the age of six are not admitted to mainstage productions. All ages are welcome at summer children’s musicals. Broadway Rose Theatre Company produces children’s musical productions each summer featuring professional performers supported by an ensemble of students from our drama camps. All ages are welcome at the 50-minute performances, full of music, dancing, and audience participation. After the show the audience is invited to meet the cast and get autographs. A 50% deposit is required when booking group tickets. If the order is canceled at least 15 days prior to the performance, the deposit minus a $20 cancellation fee will be returned. Group ticket prices, for any age, are $8 each for 10-19 tickets and $7.50 each for 20 or more tickets. All seats are assigned. A final head count and the remaining balance are due 14 days prior to the performance. The headcount can be changed without penalty prior to final payment. After final payment has been received, additional tickets can be purchased, if available, at the regular rate of $10 (ages 2-18) or $12 (age 19+). We will try to seat additional tickets with the group, but cannot guarantee it. To book your group for our children’s productions, please download and complete this form. Thank you and enjoy the show! All of these terms and conditions are subject to change without notice.